Christian Reilly - I want a comedy night! 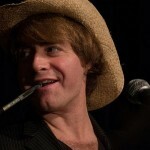 CHRISTIAN REILLY started playing guitar and singing for the American comic polymath, Rich Hall in 1999. High points included winning the Perrier Award in 2001 for “Rich Hall is Otis Lee Crenshaw”, being on subsequent CD and DVD releases, seeing the world and appearing on stage with Seinfeld star Michael Richards. In the gaps between touring, Christian worked on a BBC radio show with the hugely-talented Richard Herring, This lasted for three series and gave me the great gift of an assembled audience to foist his songs onto. In 2009, he joined Herring again on his ground breaking podcast, As It Occurs To Me which lasted about 3 years and won the Chortle award for best internet comedy. He has also played guitar in Bill Bailey’s band – Beergut 100 – for a bit, which was great. There is even photographic evidence to prove it happened. TV includes The Graham Norton Show and Late Night with Conan O’ Brien.